Our May 6th Daily Denim Giveaway for a pair of men’s or women’s SOLD Design Lab was won by Rositsa Lazarova Kehayova, Bulgaria. 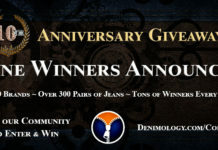 To find out which brand of jeans is being given away today and learn how to enter, check out our amazing $5000 Denim Giveaway Section. @Lexiquin is following, tweeting, subscribing, and liking. Thanks for the giveaway. im SOLD too these jeans!